Here is Grubb & Ellis' weekly market update courtesy of Bob Bach, Grubb & Ellis' Chief Economist. Commercial real estate fundamentals lag the economy, but one market indicator in particular provides an early warning sign of impending changes. Office sublease space has increased by 12% from its recent low in the second quarter of 2007, ending the first quarter of 2008 at 81.9 million square feet. 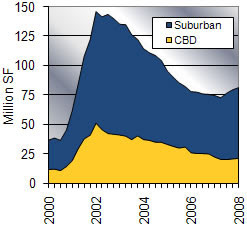 During the last downturn in 2001, sublease space more than doubled after three quarters of softening. Thus, the office market is feeling the effects of the weaker economy, but the pace of softening so far has been gradual.